I have been building e-commerce sites for the last 8 years with my web design company Double Dragon Studios. I have developed on a lot of different carts; big commerce, volusion, bigcartel, woocomerce, magento, opencart, prestashop, and a few others and Shopify is by far my favorite e-commerce solution and the only one that I develop e-commerce sites on right now. 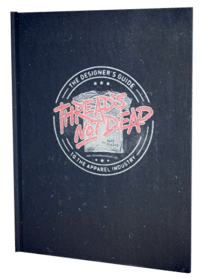 If you are looking to build an e-commerce site for your clothing company please read this article and save yourself a lot of time trying other carts that are a lot more complicated, not designed as well, and cost more. In order to be completely transparent I need to tell you that I make a $100 commission off of anyone I sign up for Shopify. I have been approached by other e-commerce solutions which will pay more money but Shopify is my favorite e-commerce solution, and the one I would recommend for anyone starting out. Here is a chart in google trends that shows the search interest in popular carts. As you can see shopify is blowing everyone out of the water and is by far the most popular ecommerce solution. Click the chart below to see data in google trends. Why go with the most popular? The biggest reason to go with the most popular solution is you have more developers working on themes and plugins. Below are listed the number of responsive themes for each cart. The first number is the amount of free themes, the second number is premium themes. I only counted responsive themes. 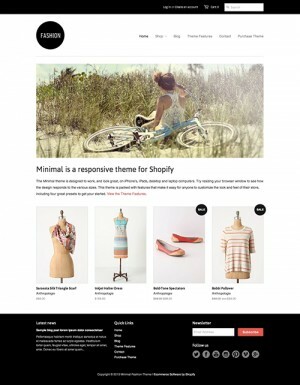 Shopify is the winner and has a lot more free and premium themes to chose from to fit your websites needs. Shopify has the most affordable prices for themes with big commerce close behind. Volusion has absolutely terrible prices and charges a minimum of $895 for a premium theme. Shopify has a lot more apps then Big commerce and Volusion combined. 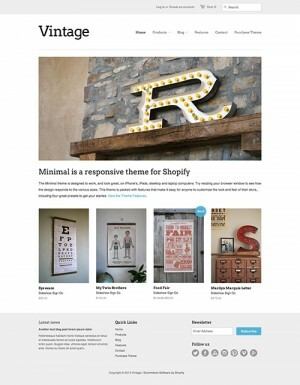 By being the most popular e-commerce system shopify gets more developers working to create themes and plugins for you. 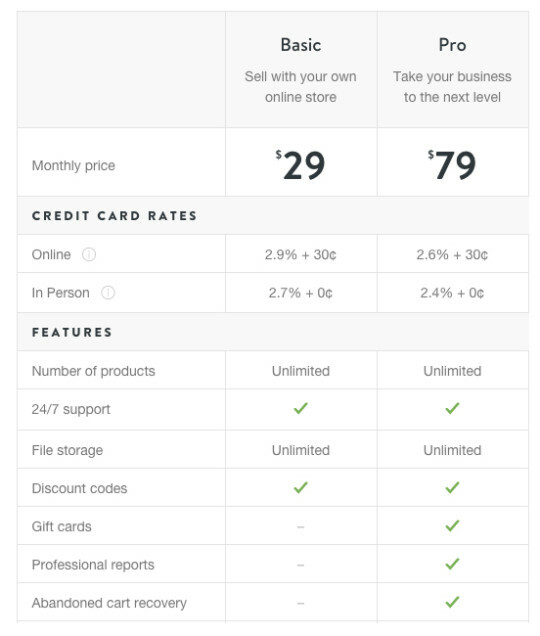 The more competition the cheaper the prices are for you and the more you can do with shopify. 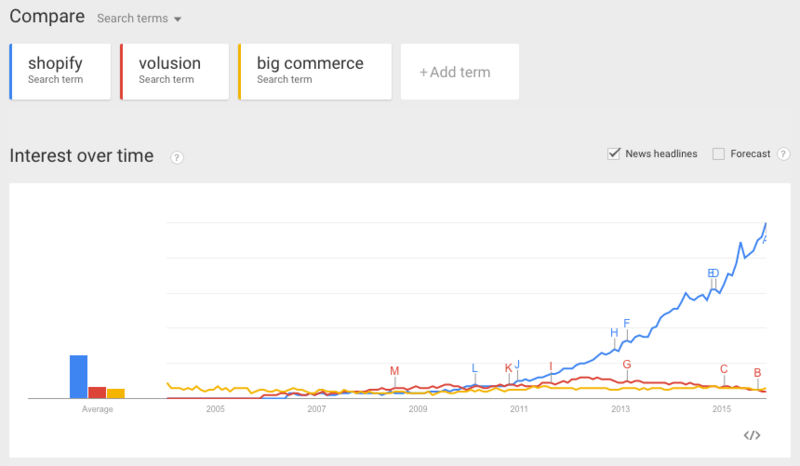 This gap is only going to continue to grow as shopify is the most popular ecommerce solution. There are free carts out there like magento, woocommerce, opencart, and prestashop. One thing I have found with all of these is that free always costs you more in the end by how much extra time it takes to get everything working right. All of them have been a headache to develop for! They are either too complicated or don’t offer the features I want. So many times things would get broken and when you are making a living off of your store you want everything working right! Any down time is lost sales, and a headache. Shopify is worth every penny just in how easy everything is and they have a couple different plans to handle your needs. I would suggest going with the basic plan at the beginning. You will get everything you need to start out. Once you start getting a little more cash flow and are selling more products you can move up to the Pro package. The Pro version is a little pricey for what it is. The abandoned cart recovery is nice to get lost sales but not worth the $50 extra when you are starting out. One of the things I love most about Shopify is their themes. They have 100+ free and premium responsive themes to fit exactly what you are looking for. The most important thing to note is that all of these are responsive, so they will look great on any screen; pc, laptop, tablet, and mobile. This is so important because recent data shows that more people are using mobile devices then pc’s so if you don’t have a responsive site you are losing sales. 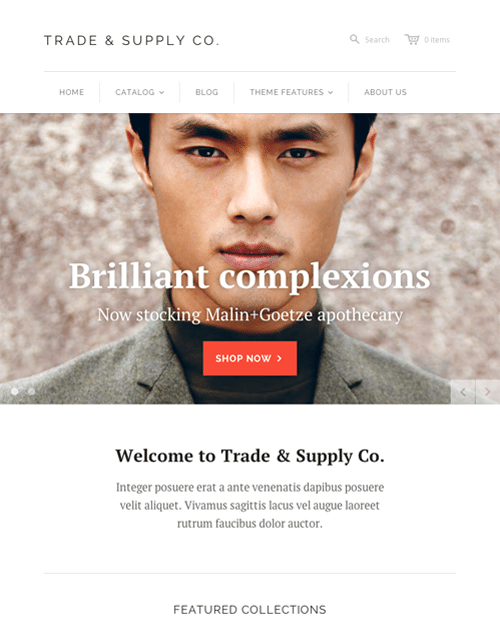 Here are some of the most popular themes, all well designed, responsive, and will make you look professional. You can check out all the themes in theme store. There are a ton of free themes and also premium themes that cost between $100-$180. The store editor is also really easy to use. I could tell you about it but just watch this video and you will have a much better idea of how it all works. Shopify is the easiest e-commerce solution I have used and haven’t had any problems handing over sites I’ve designed to clients. There are a bunch of videos and step by step tutorials and also 24/7 customer service to answer any questions you have. It really is as simple as filling in a few boxes of information, uploading a picture, putting in your inventory and you are ready to sell your products. 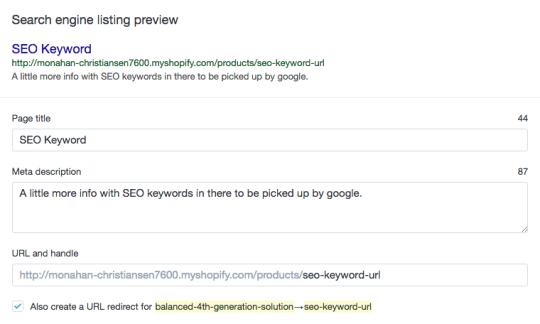 Shopify has a very simple SEO editor on the products and pages. It lets you change the page title, description, and url and give you a preview of what it will look like. All of these are essential or optimizing your page to get search engine results and shopify makes it simple. A huge plus to shopify is that it has a blog. There aren’t many shopping carts that have this option or do it well. Blogging is huge to create quality content and to get search engine traffic to your site. Shopify makes it easy to make posts, upload pictures, and write content to get search engine traffic to your site. The Shopify checkout process is simple and won’t lose customers because it is too long and complicated. 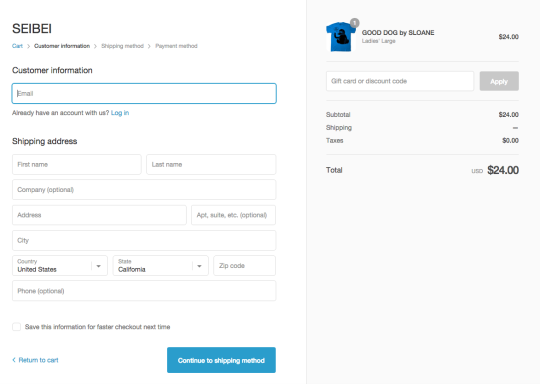 On the cart page you can use paypal to let customers skip filling out the checkout page and collect their information from paypal through express checkout. If users want to use a credit card then the checkout process is easy and quick also. 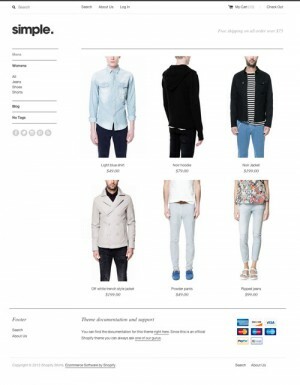 Here is an example of their one page checkout. Shopify is currently powering over 175,000 online shops and has helped businesses process over $10 billion worth of sales. You have everything you need to have the best looking and functioning website out there. They have tons of responsive themes that look amazing and the backend is easy to use while still offering all the features you need. 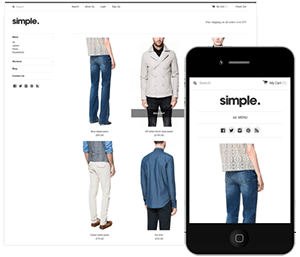 Sign up for the no risk 30 day trial and see why shopify is the best e-commerce solution for clothing companies. If you have any questions or comments please post them in the comment section below.